Are you looking for an upgrade to your entertaining space for outdoor parties? A drinks cooler for your patio might be just what you need. Having to leave your guests for frequent trips to the kitchen just for retrieving chilled drinks can be a pain, taking you away from the crowd and causing you to miss out on the fun. So if you want a highly functional patio cooler with the looks to match that will enable you to serve drinks without leaving the outdoor party, this is the article for you. In this article, we go to great lengths to seek out the best patio cooler to suit all needs and budgets. We look at the different options and types of patio cooler available, discuss their pros and cons and what to look for and what to avoid when shopping. We finish by taking a detailed look at 9 of the best models available on the market today, taking an in-depth look at all their features, and matching different coolers to different peoples needs so that you can find the best one for you. 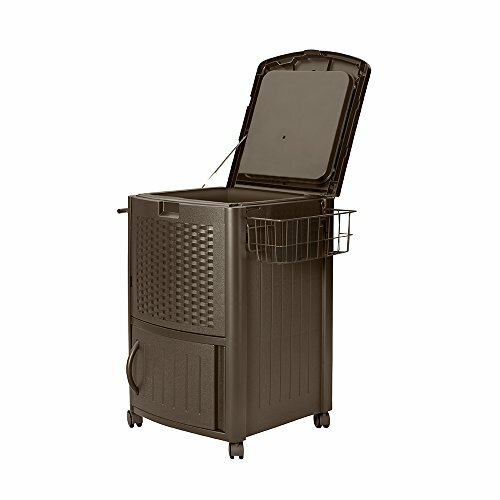 What is a Patio Cooler? What Different Types of Patio Coolers are There? Patio coolers are made to sit out on your deck or patio. They frequently sport a lid and a cavity to hold ice and beverages. Many are fitted with drains, and some have fun extras, like bottle openers and prep spaces. Better than your standard ice chest, these coolers are designed specifically for guests and entertaining. All you need to do is fill the cooler with ice and insert the soon-to-be-chilled drinks. Patio coolers are great for parties or when you’re outside with friends or family, for long periods of time. Why keep traipsing back to the refrigerator when you can have a cold drink within arm’s reach? When shopping for your patio cooler, you’ll first need to determine which type is suitable for you. Though soft sided coolers are best reserved for travela nd not your patio, there are still many different types to choose from. 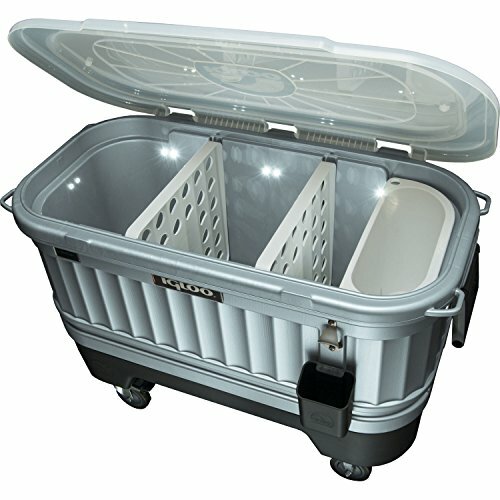 These are usually large capacity coolers on wheels and frequently offer storage space, a lid, and a built-in drain. They are simple to move around, even when full, and allow you to bring the party with you. If you have limited entertaining space – or multiple spaces where you plan on using your patio cooler – a moveable model can be a great option. You can wheel it to where you need it, when you need it, or just as easily move it to a dedicated storage space out of the way when not in use. Standing chest coolers are much like the rolling variety but without wheels. While not easy to move, a standing chest cooler can be an attractive permanent fixture in an outdoor entertaining space. They can also be highly decorative. Whether built-in or freestanding, they can be a functional addition to your “al-fresco” adventures. Typically elevated and usually without lids, standing bucket coolers typically have less capacity than chest coolers, but work in the same way. Add a little ice and a few beverages and, in no time at all, you can be serving chilled drinks. Bucket coolers are great for shaded locations and situations where you want more than one cooler placed throughout an entertaining area. Versions with a lid work better for long periods of direct sun exposure, due to the extra insulation. Patio coolers come in a variety of types and sizes, with different build quality, design and features. The one that’s best for you will depend on multiple factors, so let’s discuss this and help you choose the best featyures for you. If you frequently host large parties with plenty of guests, a chest cooler will work well for you. If those parties are by the pool and offer little protection from the sun, you’ll want something with a lid. That lid will trap coolness in and keep your ice around longer. If you have a dedicated entertaining area, you may find a standing chest cooler suits your needs. If, however, you have multiple entertaining zones and want one chest cooler that’s capable of easily traveling, a rolling model will be best. Rolling coolers are usually made with lighter weight materials and need to be protected from inclement weather. Carve out some dedicated storage space, where they won’t be subjected to the elements. Standing chest coolers, on the other hand, are frequently made from heavy-duty materials. Throw a protective cover over them during the offseason, and they should withstand the wind and rain. Bucket coolers are an excellent option for small get-togethers, or if you want more than one to provide different kinds of drinks, or to serve from different areas of your patio. Have a party with mixed age groups? One bucket might contain juice boxes while another one has soda. Entertaining adults? One bucket cooler might hold wine and another beer. Look at the space you plan to entertain in and who (and how) you usually entertain. The answers will help you determine what type of cooler you require. Will you be having a small dinner gathering or a massive block party? Knowing how many people you’re going to entertain will help you determine what capacity you need from your patio cooler. Have no fear, they come in a wide range of sizes. Are you looking for a small modelthat can accommodate 32 quarts (think picnic for two) or a large cooler that holds 80 quarts for that tailgate party coming? You’ll probably have an aesthetic in mind when it comes to your new patio cooler. Whether you need one that looks rustic and repurposed, or something sleek and modern, or one that speaks of yesteryear, there’s a look you’re bound to love. While you will probably have a preferred style, you can expect all patio coolers to essentially work the same way, regardless of how they look. Some may be low-tech, but they are great at what they do. Coolers are made from all types of materials, with the most commonly used being plastic, metal or wood. Often, most models will be made with a combination of these materials. You will likely find synthetic material and insulation on the inner portion of the cooler, though there are those lined with metal. Let’s look at the pros and cons of each material. If you’re looking for low maintenance, you’ll probably want to stick to plastics. Metal and wood can be attractive and functional, but will require more care, cleaning and maintenance. The good news is technology has advanced to the point where “plastic” doesn’t necessarily mean you’ll end up with that cooler you remember from childhood. New synthetic materials are cropping up all the time and are generally low maintenance, durable, and sun and weather resistant. If you want something that will look good year after year, you’ll probably lean toward synthetic and plastic materials. It’s possible a plastic cooler might not be your preferred aesthetic, but they do require virtually no maintenance or care. Rinse it out after use and give it a good clean at the end of the season. Metal and wood coolers, on the other hand, tend to be more heavy duty (and also physically heavier). They are frequently focal points in an entertaining area due to their decorative appeal. If you plan on keeping your metal or wood cooler in an exposed area, you’ll want to invest in a protective cover. Even a simple outdoor cloth cover can do wonders for preserving the life of your equipment, especially over winter. If your cooler is easy to move and you don’t want to keep it outside, it should be relocated to a sheltered area when not in use. Garages, sheds, and covered patios can all make great storage spots. Whatever look you end up going with, you’re going to want it to stay in that condition as long as possible. Do yourself a favor and spend some time learning just what your cooler needs from you, to stay in its best condition. While most coolers are used in the same way, caring needs for different models can vary greatly. A quick hose down after use and at the end of the season may work for a cooler made of synthetic materials. However, a copper or wooden model could require regular cleaning and sealing to help protect and preserve it. Every material, style, and finish will have its strengths and weaknesses. Take a good look at how they’ll blend in with the way you live and entertain. It will be up to you to decide where you’re willing to compromise, and to determine what works for you. For instance, do you love the look of copper but hate the maintenance? Settle for a synthetic with a similar look. You’re not the only person out there who wants the look without the upkeep. Chances are you’re looking for a patio cooler to keep your beverages cool. You may be surprised to know there are useful extras included with someproducts. Want a built-in cutting board? Need drains for easy cleanup? Bottle openers and cap containers? Many coolers offer these, and more. If you’re looking for an entertainment and prep center, some models integrate these features too. Don’t have a use for bells and whistles? Unadorned patio coolers are readily available too, and you’ll find they likely cost less too. Patio coolers can be obtained for very little money. Conversely, you can expect a top of the line designer model to cost a prety penny. First of all, determine the type and style you’re interested in. Settle on a price point and move from there. You may be smitten with that designer cooler you saw in last month’s magazine. Don’t like the price tag? A little research may show you some options with a similar look for a fraction of the price. There’s a cooler out there for you, whether you plan to spend a lot or a little. But please, do set a budget and try to stick with it, while keeping in mind the old adage that ‘you get what you pay for!’. If you’re in the market for a rolling chest patio cooler, these are some of the best available and are models you may want to take a closer look at. Are you looking for a sleek, functional design with a look worth loving? The Belleze 014-HG-14144 has the modern look you crave, but with the function you need. The cool stainless steel body and utilitarian cart base blend modern aesthetic with a pinch of the industrial. Whether you have a traditional backyard space or one that’s more cutting edge, this transitional piece can fit right in. This cooler is made with high-grade materials and designed to cool efficiently. The unit is well-insulated and ready to maintain your beverages’ cold temperature for several hours – whatever the exterior weather might be. The 80-quart capacity can hold 20 gallons – that’s 100 12-ounce aluminum cans. Whatever size party or gathering you’re looking to host, this cooler can help you accommodate your thirsty guests. The casters on the unit are 3 inches by 1 inch and allow for great maneuverability, 2 of which (one each side) are lockable to help ensure your cooler stays where you place it. This is a unit that’s made to entertain. It comes with an integrated bottle opener with cap catcher. The low sitting shelf creates additional storage while also providing even more stability and a lower center of gravity. You can use it for cups and garnishes, food, or other party supplies. The back of this cooler sports a drain for easy cleanup. The cap collector will also help keep your party space clean and make after-party chores a breeze. Dimensions: 36 1/4 inches x 20 inches x 34 1/2 inches. Attached bottle opener and cap collector. Some owners have noted difficulty in assembly. This is the perfect cooler for large gatherings. If you’re looking for something mobile that’s equipped with all the extras, you might need when entertaining, this unit fits the bill. More than just another cooler, this piece is the center of attention. If you’ve been looking for a patio cooler that really makes a statement, the Outsunny 80 might be the one for you. Available in multiple colors and textures including a brown-wicker look or a vibrant, classic red, the Outsunny is made to stand out. Whether you’re looking to complement a sleek, modern yard scheme, or add a dash of retro whimsy, this cooler can accommodate your style. A large-capacity cooler, this unit can hold up to 80 quarts. The durable frame is made of steel and creates a solid foundation. Two access doors to the top lid make it easily accessible and help keep beverages chilled for longer. This cooler has a drain port located at the back. It also has an attached bottle opener and cap collector. The low shelf provides additional storage and stability. Each of the wheels are equipped with a lock mechanism, and two carrying handles allow it to be moved and maneuvered easily. These handles are especially helpful if you’re moving the cooler over terrain that’s not conducive to wheeling, enabling you to lift and carry. This cooler does a great job of keeping ice frozen and your beverages cool. It’s not, however, structurally sound enough to move once it’s loaded down with ice and beverages. Make sure to move it to its final location before filling it. Dimensions: 37 inches x 19 inches x 34.5 inches. The choice of fun colors. Locking mechanism for the wheels. Bottle opener and cap catcher. Is not structurally sound enough to be moved once full. The metal finishes can be easily scratched or dented. This red option we’ve chosen is a fun and attractive cooler that will add just the right amount of zest to the next part you plan to host. If you’re ready to take the plunge and bring it home, click here to see the current price and shipping options. Looking for something stylish with a small footprint? Not everyone has endless amounts of space to dedicate to their cooler. Is your entertaining space on the small side? But you still want a cooler that packs a punch? This Suncast model might just be the one you’ve been looking for. Made out of resin wicker, this is a long-lasting and low-maintenance cooler. It will resist sun-fading and requires very little to keep it in tip-top entertaining shape. This cooler comes equipped with a drainage tube and a storage cabinet beneath the internal cavity. The same ice that cools the drinks above helps keep the temperature in the cabinet cold as well. With two locking casters, you can be assured your cooler is only moving when you want it to. You’ll also love the wire bin that provides additional storage – great for beverage cups or garnishes – and the towel rack. It also boasts a significant capacity despite its smaller size. It’s a great choice for cans, two liters, and glass bottles. Assembly is a breeze, with its snap together construction. Dimensions: 22 inches x 26 inches x 34 inches. Capacity: 77 quarts/72 cans/6 2-liter bottles. Small footprint and extra storage. Made with durable and easy-to-maintain materials. Classic design and color—perfect for any kind of backyard. Simple to assemble with an easy-to-use drainage system. Coordinating outdoor furniture is available. Wheels don’t work well on uneven terrain. The wire storage basket is vulnerable to rust. Have you been searching for a small cooler that fits seamlessly into the surrounding entertaining area? With the help of the coordinating seating and yard decor from Suncast, this model can make that a reality. No need to sacrifice portability to have a quality cooler on wheels. If you’ve been looking for something other than the traditional red and white plastic cooler to make the rounds with this summer, look no further. This Igloo cooler is made to travel. It’s also not compromising on quality, looks, or functionality. If you plan to host on the go, whether it’s beachside, field-side, or tailgating for your favorite team, this cooler is ready to work for you. The Igloo is fully insulated. Ice stays colder longer, and so do your drinks. Sixteen LED lights provide enough light for you to find the drink you’re looking for, even if the sun has already set. Its casters are heavy duty and capable of moving the cooler, even when it’s loaded with beverages. The base is removable just in case you want to keep it on an elevated surface or don’t have a need for the wheels. This is helpful as you travel from location to location, especially if you have a smaller trunk. The cooler has a threaded drain plug that’s compatible with a garden hose. It also has a bottle opener and a bottle cap catcher. Drink dividers are included, allowing for separate drink sections in the one unit. You’ll love the vintage washtub look of the exterior, as well as all the extras Igloo has put into it. The ultimate cooler for people on the go, you’ll be reaching for this product when you’re hosting at home as well. Dimensions: 39.1 inches x 26.8 inches x 21.5 inches. The unique and charming exterior. LED lights for night-time use. Lights run on 4 AA batteries. Assembly is required and can be difficult. The Igloo brings all the classic features you love in a traveling cooler and also all the cutting-edge features you never knew you needed. If you’ve been looking for the perfect party cooler, you may have found it in the Igloo Party Bar cooler. Not everyone needs a mobile patio cooler. 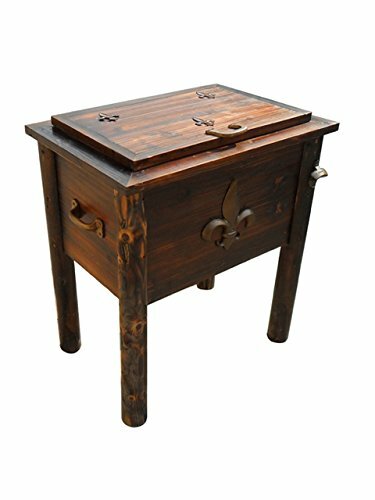 If you’re looking to bring home a standing chest model instead, here is a selection you won’t want to miss out on. Looking for a beautifully crafted cooler that makes a statement? Sometimes, coolers offer more than just their utilitarian purpose. If you’ve been looking for a product that genuinely adds to your entertaining space, you may be interested in this Leigh Country cooler. Adorned with a “Fleur De Lis,” this piece can add a classic touch to the look of your patio. Made with rustic wood and given a “charred-look” varnish, this cooler feels more like a piece of furniture than equipment that’ll keep your drinks cool. Just because it looks like furniture, though, doesn’t mean it isn’t ready to work as a cooler should. All accents are made with powder-coated metal to resist damage and rust from the elements. Even so, this is the kind of cooler you’re probably better off protecting when it’s not in use. A mid-sized cooler, the Leigh Country has a capacity of 54 quarts. The cooling cavity is insulated with food-grade polyurethane. A bottle opener and a drainage hole valve are both built into the front. If you’re in the market for a high-quality cooler your guests will notice, take another look at this model. Dimensions: 27 inches x 30 inches x 19 inches. Not as weather-hardy as some. When you need something that brings looks to the table as well as functionality, this cooler delivers just that. From the carefully applied finish and the rustic material to the carefully selected hardware, you’ll love the finished product. Love the idea of the Fleur De Lis model, but it doesn’t suit your decorating scheme? If you love the look of the Leigh Country Fleur De Lis cooler, but it’s not quite right for your backyard decor, consider this “Grey Wash Stain” model instead. This model offers the same great things the Fleur De Lis cooler does, but with an entirely different aesthetic. 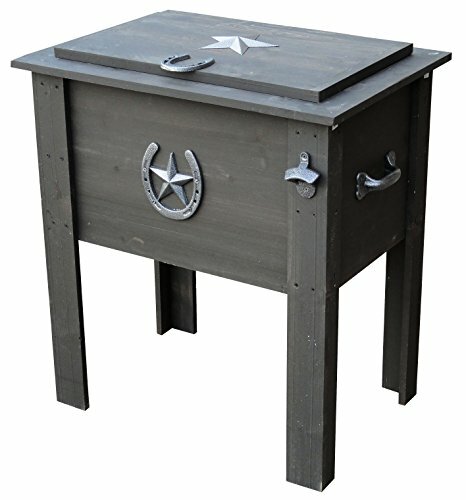 You’ll love the vintage feel to the grey wash stain and the country-inspired horseshoe and star adornments. Like the Fleur De Lis, this unit offers powder-coated metal accents and hardware, a 54-quart capacity, a bottle opener, and a built-in drain. The light-colored, complementary metal accents. The polyurethane coated cavity won’t rust. May be too delicate for harsh weather conditions. Whether you choose to go with the Fleur De Lis model or the Grey Wash Stain, you can’t go wrong. Just remember the pinewood it’s constructed from is soft and won’t weather well unprotected. Keep your unit under cover when not in use, and you’ll be using these attractive coolers for years to come. 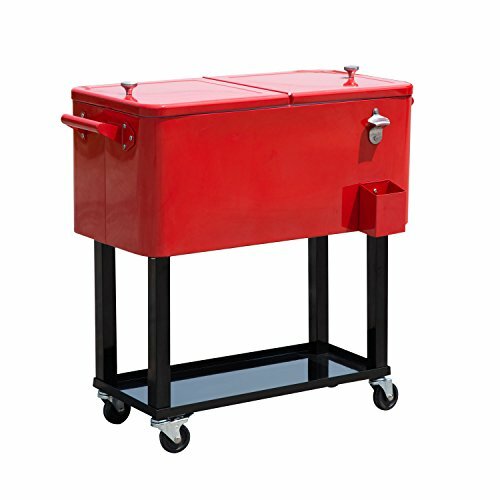 If you’re looking for something different from the chest cooler types, you may be interested in a standing bucket cooler? This type is usually open at the top and are lidless, and can be the perfect accompaniment for your party decor. Looking for a cooler that’s ready to pull double duty? 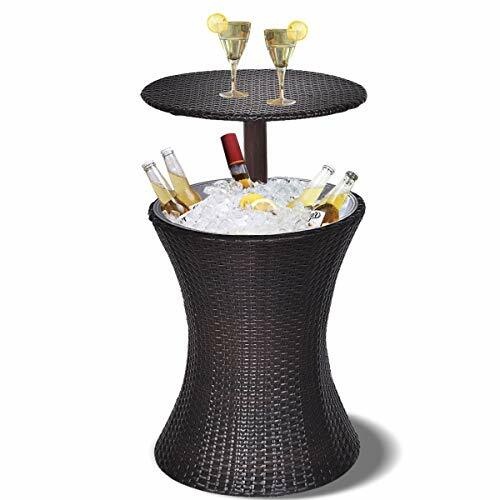 You may be interested in this patio cooler/bar table combination. If you’re tight on space, or you just like the practicality of a piece of equipment that’s ready to serve multiple purposes, this Giantex product can be a great addition to your patio. Simply fill the base of this cooler with ice and stock up with your favorite beverages. The bar table top is adjustable, so pull your chairs up and customize the settings to your needs. If you don’t have a need for an additional cocktail table, you can always choose to keep this tabletop low, like a traditional lid. This cooler is designed to keep your beverages cool for long periods of time. You’ll also love that it’s easy to clean and to move. It’s made from weather-resistant “PE” (polyethylene) wicker, so it can be kept outside unprotected until you need it. A drainage plug design will keep ice and water where you want it while in use, but leaves cleanup extremely simple. The table-top lock keeps your table safely in place when it’s being used. When you’re not using it, simply slide the table top down into the top of the beverage cavity and it becomes a convenient end table. You’ll love that this piece is UV resistant and high-temperature tolerant. The inner bowl is removable for thorough cleaning. Dimensions: 17.3 inches x 22 inches x 37.4 inches. Won’t fade or be damaged if left outside when not in use. Metal components have not been treated to prevent rust. This unit is lightweight – don’t leave it exposed to excessive winds. If you’re looking for a great piece at a great price, especially one that offers multiple uses, this Giantex Outdoor Cool Bar station is a great option. Whether you use it as a table for two, or a sun-protected vessel for your cold drinks, this one-stop party piece will have you covered. Looking for a smaller cooler with a great aesthetic? Consider this Best Choice Products Wicker Ice Bucket. Not everyone needs an oversized cooler. If you’re looking for a smaller capacity for intimate gatherings and a few guests, this wicker ice bucket might be just what you’re after. This ice bucket is elevated and has a flat wicker lid that can be used as a prep or table surface. The inner galvanized tub can be removed for easy cleaning. This cooler was made to last. The wicker exterior hides inner aluminum framing that provides structure, strength, and durability. The resin wicker is equally sturdy, and both weather and UV resistant. It should look just as good the first day you use it as it will look several seasons later. Non-slip feet enable you to use this cooler on all types of surfaces. Whether it’s a field, gravel, or a smooth patio, it can be set up wherever you need it to be. The additional storage shelf below allows for oversized bottles, cups, and other entertaining accessories. You’ll also find it helps create more stability. If you’re using your ice bucket on unlevel terrain or under excessively windy conditions, you may want to leave heavy items down below. Resin wicker has a classic look and feel. Unlike traditional wickers, though, it’s made to withstand the elements. You’ll love how this bucket cooler performs, and its affordable price tag is equally attractive. The lid provides a useable surface. Low shelf for additional storage. Galvanized beverage tub is removable. The inner galvanized tub may leak at the seam onto supplies below. The lightweight lid may blow away. If you’ve been looking for a smaller cooler that still gives you great looks and functionality, this product is worth taking a look at. 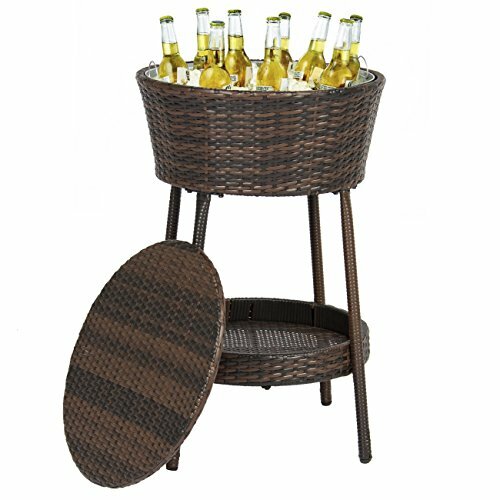 If you’re interested in learning more about this Wicker ice bucket and other products made by Best Choice Products, click here for more information. Sleek, modern design at a price you’ll love. You can still have a great ice bucket, even if you’re looking for something that offers more modernity than rattan and wicker. This Keter Cool Bar is a great option if you need something that’s less classic and more cutting-edge in your entertaining space. 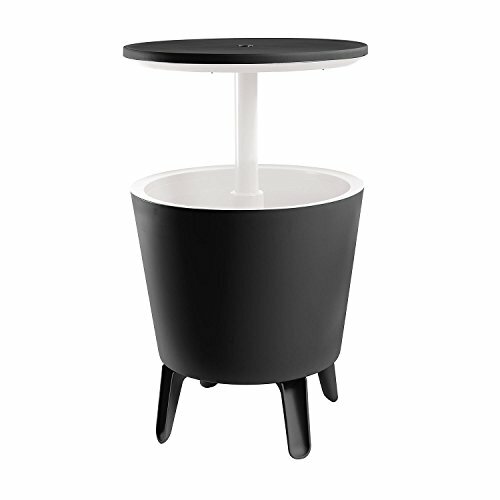 Set low to the ground, this piece has an adjustable tabletop lid. You can use it as a small table, a traditional cooler lid, or collapse it for coffee table height. You’ll love the versatility of this piece and how easily it works with your outdoor decor. The table top locks safely into place when in use. Ice and beverages are placed in the belly of the unit, so they’ll be cool when you’re ready to enjoy them. This piece is lightweight. While it’s not on wheels, you’ll find it’s easy to move around from location to location. With a 7.5 gallon capacity, you’ll have more than enough beverages to keep your thirst at bay. This is a piece that’s great to use at home but can travel with you if you go out on the road. We love the classic black color of this piece, but if you’re interested in something that packs more of a punch, it’s also available in coral and teal. There’s no reason that a modern look should always be understated. Dimensions: 19.5 inches x 19.5 inches x 22.5 inches. Lightweight, easily portable, and simple to put together. Draining system for easy emptying and cleaning. Not great for extended cooling periods as it isn’t insulated. The unit is prone to surface scratches. 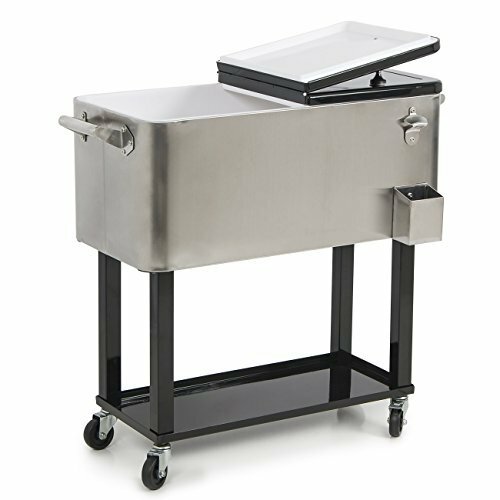 If you’re in the market for a small bucket cooler that’s capable of doing many things, you’ll want to take a closer look at this Keter product. Whether you’re spending the day poolside, or a few hours at the soccer field, it is portable, versatile, and has that modern look people love. If you’d like more information on this Keter cooler, and other products offered by Keter, please click here for more information. We hope these products have given you a good snapshot of what’s available on the market when it comes to the best patio coolers. If you weren’t sure which direction you were going to go in for your purchase before, hopefully you do now. We’d love to hear your thoughts. Do you have a cooler we’ve missed here that you can’t recommend highly enough? Is there something you won’t compromise on when it comes to your patio coolers? Help us out on our shopping venture by posting in the comments below. Or maybe you have a question you’re dying to ask? We’ll tackle those, too. Leave it below and we’ll get back to you as soon as we’re able to. We promise we’ll answer every question in a timely fashion.